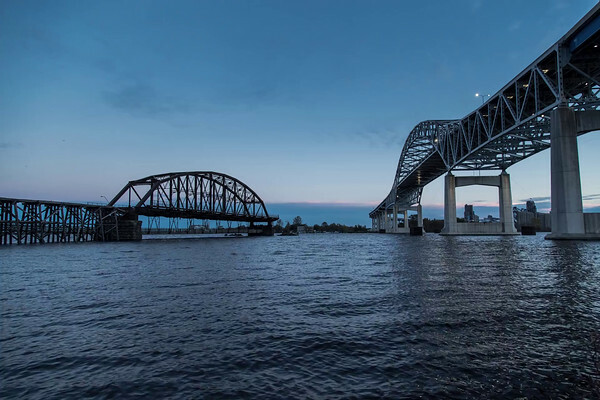 The John A. Blatnik Bridge carries Interstate I-35 and U.S. Highway 53 over the Saint Louis Bay. The bridge is a mile and a half long and rises up nearly 120 feet above the water. It was dedicated on December 2, 1961, and was renamed for Congressman John Blatnik on September 24, 1971. The bridge replaced the nearby Interstate Bridge also pictured here which was a swinging toll bridge that carried both automobile and rail traffic. The Interstate Bridge is now used as a fishing pier.